spectrum pulse: album review: 'give a glimpse of what yer not' by dinosaur jr.
album review: 'give a glimpse of what yer not' by dinosaur jr. I've said a number of times in this series that it's difficult to talk about legends - and yet that's definitely not something I'd say about Dinosaur Jr., one of the bands responsible for creating the rough-edged jangling side of indie rock in the mid-80s we've all come know and love. It's an act that's defined by three distinctive eras, all with their own high and low points, strengths and weaknesses: their early indie years in the 80s before the departure of bassist Lou Barlow; their major label years in the 90s; and everything after that. Where things get interesting are when you discuss which of the eras was best, because again, they each had their own strengths and weaknesses. Personally, I'm partial to their rough-edged material in their early years, especially Bug which I'd call a indie rock classic, mostly for a lot of the same reasons why I like early Weezer in terms of composition and letting the rattling basslines interplay with the main guitar melodies. Now don't get me wrong, there are good tracks after Barlow departed, but they rarely had the same edge as borderline J Mascis solo projects - especially Without A Sound - and none of them were really comparable to what Barlow was doing with Sebadoh anyway. Things definitely improved when they reunited in the mid-2000s for a pretty solid string of records - Farm is probably the standout for me - but it also was clear that J Mascis was starting to understand Barlow was the foundation of the group, which led to basslines that weren't exactly rougher but more prominent all the same. And hey, that was a progression I wanted to see continue, so you can bet I was interested in digging into Give A Glimpse Of What Yer Not - how did it go? Well, about as well you could expect: it's another Dinosaur Jr. record, the sonic palette has only made subtle changes throughout the band's history, and if you like it, you'll probably like a lot of this. I do appreciate this record hewing closer to the rougher side of the band like Farm and Bug did, although I wouldn't quite put it up to the quality and punch of either of those albums. But I would probably put this closer to the upper end of Dinosaur Jr. albums - there's definitely a formula, but it's a damn good one. So when we start with the instrumentation and production, it's easiest to put things in context of the band's history, which is of their post-reunion records this is probably the most groove-heavy and chunky to date - not as immediate and energetic as Farm with its irrepressible melodic hooks, but also ditching the keyboard flourishes and other odd elements of experimentation that cropped up on I Bet On Sky. The tempos as a whole tend to be a little slower, the guitar leads a little more blended into the mix, which leads to a thicker sound but also means that certain elements don't quite jump out in the same way - with, of course, the exception of the guitar solos, which nearly always give the tracks a welcome boost. Now a more homogeneous sound does have its advantages - the melodic grooves are nearly always solid; it draws attention to the great solos that show up on 'Goin Down', 'I Told Everyone', and especially on the slower, more sludgy 'I Walk For Miles'; and individual moments really stand out all the stronger, like the cascade of thicker drums that show up on the opening rumble of 'Good To Know' or the huge echoing booms behind the acoustic interlude on 'Left/Right'. But it also means that some moments can start to feel a bit out-of-place - even though I really like 'Love Is...' with the rough noisy bass and acoustic groove that has a great solo, it really does stand out like a sore thumb against the rest of this list, with a similar case for the more muscular grooves and harder bassline on 'Mirror'. And more distressingly, it means that when the back-half kicks into the slower or more circular melodic progressions, it can lose momentum - even kicking into a much more aggressive second half on 'Knocked Around' doesn't quite do enough to recover for me. And that can get exasperating when you're trying to pay as much attention as possible to the vocals, mostly because J. Mascis places his regular vocals just a shade too quiet in the mix, and it's easy on songs like 'Good To Know' for them to get drowned out. 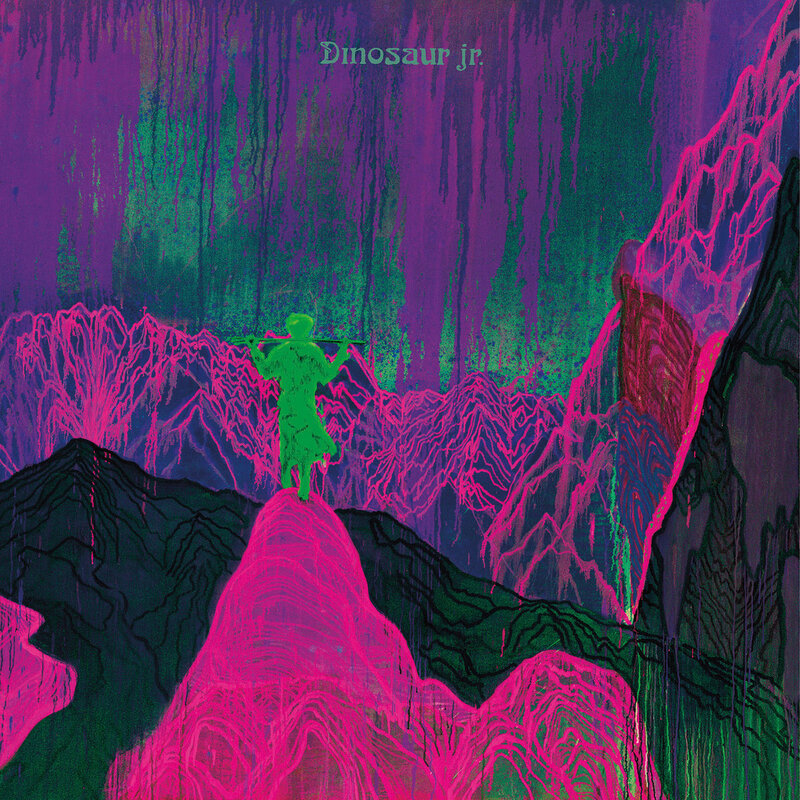 Granted, it doesn't happen as much with his falsetto on 'Lost All Day' and 'Knocked Around', but I'm also not particularly wild about that vocal tone - and here's where I admit that what probably holds me back from being a bigger Dinosaur Jr. fan are the vocals. I admit there's a certain appeal to the depressed, consistently lethargic hangdog delivery, but on a record that can lose momentum or start to blur together after 'Love Is...', that's a bit of an issue. Barlow's vocals are a little more clear and passionate, they probably hold my attention a little more, but I'm also left feeling they'd probably play better against production that's a little cleaner, which is one of the reasons the smoother tones on 'Left/Right' connect for one of the best hooks here. Of course, the reason I was trying to listen so closely for the lyrics is that if you want to try and examine the themes or content of this record, you're going to need to as the band has never posted them. And coupled with the fact that Mascis' lyrics have always been cryptic - ambiguous pronouns, seemingly contradictory statements, no clear sign of a narrative - it can be tough to find the emotional throughline of the album... which from what I could parse out, mostly fits the mood. There is an exhausted frustration with the faltering or failed relationships on this record, from the paranoia and reluctance to meet an old flame on 'Tiny' to the cycle of starting a relationship too soon after heartbreak on 'Be A Part', which only triggers a breakdown to be restarted with a new girl. And that's the thing: this is a protagonist that is trying to step outside of his comfort zone or give more honest affection, and that he keeps getting exploited or left hanging in front of a world that seems to see through his deflections drives the anxiety at the core of this album. It's one of the reasons 'Love Is...' is one of the strongest tracks here: love was professed and even as things are falling apart, he's trying to cling to the sentiment that the words matter, damn it, and that if she's going to throw it all away she should be held accountable for it. And it makes songs where it's apparent the love is gone and yet she's still looking for something all the frustrating like on 'Tiny' and 'Knocked Around' - and yet he's still going back. And yet as much as he professes early on 'Goin Down' that he can't 'break himself', there are toxic attitudes of self-sabotage and recklessness that he needs to get over and accept responsibility. And that's one of the big reasons the last two songs on this record really do connect, the first being 'Mirror' where he's stuck in yet another lousy relationship situation but is now coming to realize his own culpability that for as distant as she might be, he's just as toxic. And that leads to 'Left/Right', where he acknowledges his lying, his fear, his clinginess, and yet how what really broke him was her actually reaching out. It leads to the most honest moment on this record, ripping away the disaffection and toxicity in the penultimate line: 'if you want it I need it / if you could need what I want' - it still reflects the same character, but the desire for simple reciprocity and respect rings as real. So in short... again, this is not my favourite Dinosaur Jr. record - Farm and Bug probably still hold the top there - but this is still remarkably solid once you put in the time to really decode the emotional pathos. And again, the frustrated emotional undercurrent is not something you're always going to be in the mood for, but this album is smart enough to show that glimpse of complicated framing that reflects real humanity behind it, peel away the detachment to what's really beneath it. And again, in terms of solid indie rock Dinosaur Jr. are long-time veterans in crafting solid melodic hooks and great solos, so for me it's a strong 7/10 and definitely a recommendation. If you're a Dinosaur Jr. fan, particularly their rougher stuff, you'll probably enjoy this record, but even if you're not... I'd check out Farm and Bug first, but I'd still give a listen - it's worth it.